Beat the Traffic: How Does Your City Rank? Metromile app users in Los Angeles spend an average of six hours per week in their cars. And a new study from TomTom finds that coincidentally (or not coincidentally) LA is the most congested city in the US and the 10th most congested city in the world. So what does that mean for your commute? And more importantly, what can we do to reduce all of this congestion? LA has a 40% increase in overall travel time compared to what TomTom classifies as “free flow”, which means driving without any congestion. Other major west coast cities are up there too: SF at 34%, Seattle at 31% and Portland at 26%. All of these cities have more traffic on local roads versus highways. Interestingly, all of these cities also have about a 15-25% increase from morning peak hours to night peak hours. 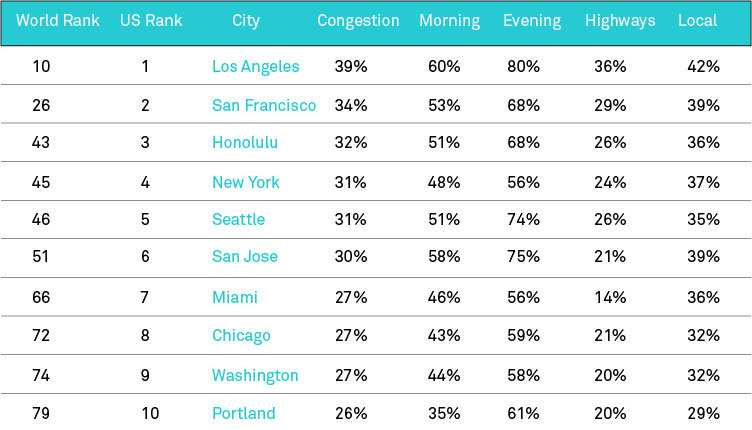 Portland has a 35% increase in travel time in the morning but jumps up to a 61% increase in the evening. Meaning, your morning commute might not be that bad, but be prepared for some evening gridlock. So what is the takeaway from all of this data? Do whatever you can to drive less. Nearly all of these cities have great public transit systems, and many are focusing on making their roads more bike friendly. A national Bike to Work Week (which happens to be next week!) is also helping to raise awareness. And if you do need a car to get to work, try to avoid commuting during peak evening hours. Here at Metromile, we believe that pay-per-mile insurance incentivizes people to drive less, therefore removing cars from the road. While we are currently seeing that our LA app users spend six hours per week in their cars, our per-mile insurance customers are averaging four and a half hours. If you only get charged for the miles you drive, there’s more reason to find alternative transportation methods, like biking or taking the train. Fewer cars on the road results in less traffic, which means less commuting time for people that do have to drive! Want to see how much you could save with per-mile insurance? Learn more here! Can you guys read? This article makes so many errors. For example the chart clearly says Portland has a 61% increase in the evening, but you report 65%? Really, really sloppy. Thanks for pointing that out, updated the post.